I read 92 total books last year. That number blows me away. But, I also know that over half of them were children’s books. Still, taking the time to read children’s and YA books and reviewing them adds a lot to my schedule as well. I read 48 Children’s Books ranging from children’s to YA. There were non-fiction and fiction books, books on animals and sports, funny and inspirational books, and numerous life lesson stories. I really loved all the children’s books I read. Thanks to Booking Mama’s Kid Konnection weekly link up, I’ve made children’s book a regular feature on the blog every Friday. I read 44 adult fiction and non-fiction books in 2016. Not as many as I would have liked, but with 3 kids who are very active in school events and working quite often as a substitute teacher, I don’t always have the reading time that I want to have. I also had a few reading slumps where nothing could entice me to read. I am hoping to do better this year about regularly scheduled reading and always having a few books going at once so I can read whatever I’m in the mood for. Just like the teachers at school tell my kids, reading just 20 minutes a day can make a huge difference. 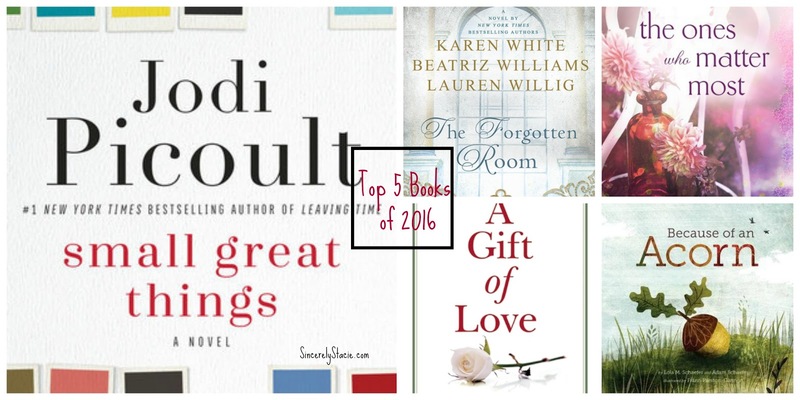 Since I write for the Gazette, they asked me for my Top 5 Books of 2016. It was tough to narrow it down to only 5. For this space, I like to make it a few more across various genres. So, I’ll share my Top 5 Books for the Gazette as well as some others I really loved. 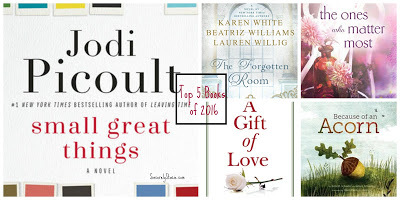 I chose these as my Top 5 because it was a good mix of the types of books I like to read. Jodi Picoult is one of my favorite authors and her books never disappoint. I love historical fiction and feel-good fiction/non-fiction. I’ve read so many children’s books this year that I couldn’t leave them out. This list also only includes books published in 2016. Three best-selling authors come together to write the story of one historic location in New York City and the three women who are connected by generations of love and loss. Told in alternating time periods, this is historical fiction at its best. I loved it because I liked how they bridged three generations of women together and how one woman’s choice can have repercussions for many years. It reminded me to listen to my heart and follow my dreams. See my full review, HERE. Abby and Fern are different as two women can be but are connected by one man. The friendship that blooms through the pages of this book is messy, frustrating, and awkward, but will remind you of what it truly means to be a family. This unlikely friendship warmed my heart and I went through several Kleenex while reading. Family is really a title for those who matter to you the most. One man’s selfish mistake changed the lives of these two women forever and yet they wouldn’t have it any other way. See my full review, HERE. This timely novel is quite possibly Picoult’s finest work yet. Reading this will be uncomfortable, thought-provoking, and will make you want to talk about it with everyone you know. My own prejudices were called to the forefront while reading this novel. It was a reality check and an honest look at how far we have yet to go in a world laced with judgment and hatred. This novel scared me and yet gave me hope that there will be a change towards love and acceptance of everyone. See my full review, HERE. In a world full of judgment and criticism, Cointreau’s stories of love, patience, forgiveness, and friendship while working in Mother’s Teresa’s Hospice will remind you that there is still goodness in the world. I learned many years ago that there is no greater privilege than spending time with someone in their final days on this Earth. No matter what has happened in the past, the greatest gift we can give someone is love. See my full review, HERE. Introduce your child to the beauty of nature and the life-cycle of an acorn. Through die-cut pages and gorgeous illustrations, children will learn how each of us has a role in the growth of a forest. This story made me want to run out to the woods and gather acorns. The illustrations sold me and I couldn’t wait to send this off to my great-niece. See my full review, HERE. Now for some of my other favorites from my year of reading. Here are 12 more favorites from my reading in 2016. This is a new genre for me and I read several from this category this year. I never liked these types of books before, but even though they stress me out, I keep going back for more. These listed below kept me turning the pages as fast as I could! This was creeped me out, but I couldn’t stop reading it. I had to know how it was all going to work out. I thought about this one for days after reading it. See my full review, HERE. This was written by an Iowa native and was set in Cedar Rapids. Having a familiar setting made the story a fun read, but the story of two brothers kept me reading. See my full review, HERE. I love non-fiction books. I usually have at least one going at all times. This year I read books that inspired me, ones that taught me about life, and ones that offered me new ways to cook. I was fascinated by this memoir of a medical examiner. My favorite section was her time during 9/11. See my full review, HERE. I have told nearly everyone I know to read this book. If you have aging parents, if you want to be sure your family knows your wishes if something medically wrong happens to you, if you want to have a conversation with your spouse about your future, please read this book. See my full review, HERE. This memoir written in prose was absolutely wonderful. Don’t let the prose/poem part scare you. It makes it so much better. It’s a middle-grade/YA read and I just loved it. My daughter read it right after me and also loved it. See my full review, HERE. Because I didn’t only read books published in 2016, I have some other favorite fiction books that I read this year. I wanted to read this one in 2015, but just didn’t get to it. Then I kicked myself for waiting so long. It is one of those books that you won’t be able to forget. Loved it! I didn’t review this one because I didn’t think I had anything new to add to the hundreds of other reviews. All I can say is…Read. This. Book. It’s being made into a movie as well! Another one I didn’t get read until this year. Then I watched the movie. Loved both of them. See my review, HERE. Another Iowa native that I had the pleasure of interviewing and reading. Really talented writer and one I can’t wait to read more from. See my full review, HERE. Since I’ve been reading more children’s books lately, I had to share my favorites. I’ll share both fiction and non-fiction books. This is the second in the Sweet Pea & Friends series and I adored it. The story of a sweet little lamb struggling to survive and growing up over a year on the farm reminded me of all the sweet baby lambs we raised when I was growing up. The photography on each page is amazing. I want to frame the book cover it is so adorable. See my full review, HERE. If you have a dinosaur fan in your house, get this book! It’s hilarious and your child won’t even realize they are learning something on every page because it is so well done. A really great science book for kids! See my full review, HERE. The first PIPSIE NATURE DETECTIVE book made my favorites list last year and this one is just as wonderful. A sweet story and your child will learn about nature at the same time. See my full review, HERE. Everything about our great country all wrapped up in one book. A great book to read with your kids and maybe find ideas for your next family road trip! See my full review, HERE. If you choose to purchase any of the books through the above links, I may receive a small commission without you having to pay a cent more for your purchase. Thanks for supporting SincerelyStacie.com.